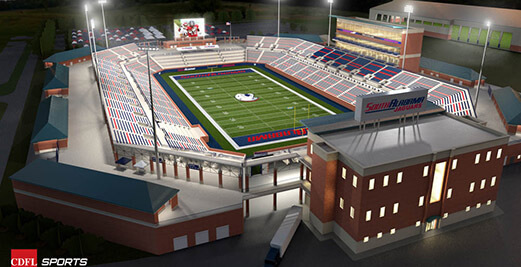 City officials are considering a multimillion contribution to the University of South Alabama’s first on-campus football stadium as part of an agreement that could see Ladd-Peebles Stadium demolished and rebuilt on a much smaller scale. Site work will soon begin for the 25,000-seat, $72 million stadium on USA’s campus near the existing intramural fields off John Counts Drive. The current plan is for the Jaguars to be in the stadium by the start of the 2020 season. While USA expects to fund the endeavor with a bond issue, its plan to pay down that debt includes a mixture of “public and private” sources. So far, the Mobile City Council and Mobile County Commission have each been asked to make a $10 million contribution to the project. When asked if the project would be possible without that level of support, USA Director of Communications Bob Lowry seemed to suggest the multimillion dollar contributions from taxpayers are more about legitimizing the project than actually funding it. So far, it’s unclear what, if any, private organizations might contribute to the project, but at least one has already declined — The University of South Alabama Foundation. Lowry said USA had “discussed this project with the Foundation” and is still “hopeful” they’d consider a contribution. Created in 1968, USAF is entirely separate from USA, though it supports the university’s “future growth.” At the end of March USAF reported more than $369 Million in net assets, but Managing Director Maxey Roberts said a stadium wouldn’t be an appropriate expenditure. For the city of Mobile, though, a contribution to USA’s stadium construction could be beneficial. As part of a proposed agreement, USA would give the city $2.5 million to help cover the cost of demolishing Ladd-Peebles and rebuilding a smaller facility in the same location — one Stimpson says could be used by high school and middle school sports teams. City and county officials will discuss USA’s request during separate meetings on Tuesday morning, but the city council will likely delay any decision for two weeks because of a rule requiring new agenda items to be tabled for further review. 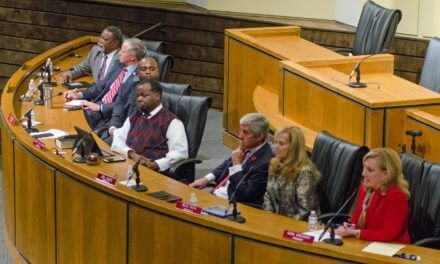 While Stimpson’s administration appears to be fully behind the idea of a $10 million contribution, not all of the council members appear to be sold on it. Councilwoman Gina Gregory has already called for an ad hoc Economic Development Committee meeting Tuesday afternoon to discuss the proposal in detail. Though nothing has been finalized, under the current agreement USA would host the Reese’s Senior Bowl, Dollar General Bowl and Gulf Coast Classic without collecting any rental fees while contributing $2.5 million toward the city’s demolition and redevelopment of Ladd-Peebles. Stimpson told Lagniappe that, if approved by the council, the money from USA could be spent demolishing the superstructure at Ladd and rebuilding a 5,000-seat, multi-purpose stadium around the existing field to accommodate football, soccer and lacrosse games. While no plans have been agreed to or even drawn out at this point, Stimpson said he’d like to see something similar to McGill-Toolen’s Archbishop Oscar H. Lipscomb Complex that could be used by middle school and high school teams. The other half of Stimpson’s reasoning is financial. According to data provided by his administration, Ladd-Peebles is in need of $6.6 million of deferred maintenance today, and Stimpson said it would require roughly $2.6 million a year to address those issues by 2023. Throughout the life of the 20-year payment plan with USA, Stimpson said the city could spend more than $33 million on maintenance, capital improvements, security and performance contracts at Ladd-Peebles, which by that point would be a 90-year-old facility. 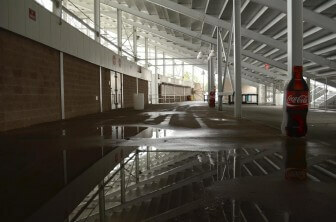 Rain water puddles in the concourse at Ladd-Peebles Stadium after a heavy downpour in Mobile. As for Mobile County, there doesn’t appear to be enough support to approve the $10 million contribution USA requested, but commissioners are expected to vote on a proposal to put $5 million toward the project during their regular meeting on June 26. However, Commission President Connie Hudson has previously raised concerns about how quickly USA’s plan is moving forward. Last week, Hudson said she was struggling to get information from USA that the county would require from most other developers seeking financial support. Last week, Hudson said the county hadn’t even had time to discuss a possible contribution or where the money would come from, though she’s been up front about her opposition to any money from the county’s general fund going toward the construction of USA’s stadium. It’s not unheard of for cities to invest in college sports stadiums. For instance, just this year Birmingham pledged $90 million towards a redevelopment project at the University of Alabama at Birmingham that will include a new football stadium for the UAB Blazers. Davis also claimed that, regardless of how new it is, a smaller stadium would make it harder to attract schools from the Southeastern Conference like Mississippi State, which traveled to Mobile to play the Jaguars last fall. As for the Senior Bowl staff, neither newly appointed Executive Director Jim Nagy nor any members of the game’s governing board have made any public statements on the idea of relocating the annual showcase of college seniors to USA’s campus. On the plus side, it would give teams and coaches access to USA’s indoor and outdoor practice facilities, but it would also put a 30 minute drive between the stadium and the hotels in downtown Mobile where NFL coaches, scouts and staff members have typically stayed.